28 year old male presents to your tertiary emergency department with chest pain, exertional dyspnoea and left calf pain. He describes a six week history of progressive exertional dyspnoea that has become especially worse over the past 48 hours. He presents to hospital today (via his family doctor) as he is now only able to walk ~5 metres before succumbing to dyspnoea and left leg pain. His GP found him to be a little ‘wheezy’ prior to the transfer, so he was given two doses of nebulised salbutamol. This had little effect. He has no significant past medical history and he takes no regular medications. On review of systems; he reports mild cigarette use (no illicit drug use), no recent overseas travel or sick contacts, no recent surgery, no haemoptysis and no prior history (or family history) of thromboembolic disease. Alert & oriented but with moderate respiratory distress & increased work of breathing. RR 30, SaO2 94% (4L via NP). Reduced air entry bibasally (no added sounds). Pulse 130/min and regular. HS dual without murmurs or rub. Distended JVP. Mild calf tenderness bilaterally (L>R) but no pitting oedema or overlying erythema. 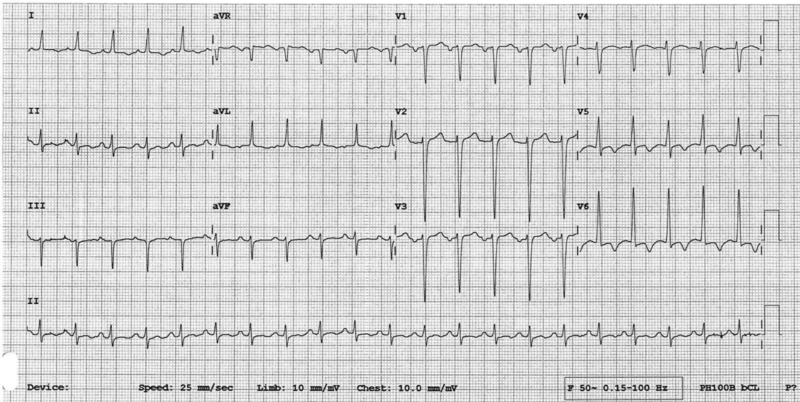 What are the important features of this ECG? A-a gradient = ~95mmHg (markedly elevated). Primary respiratory alkalosis with a markedly elevated A-a gradient. DDx include pulmonary embolism, congestive cardiac failure, pneumonia, collapse/consolidation or interstitial lung disease. 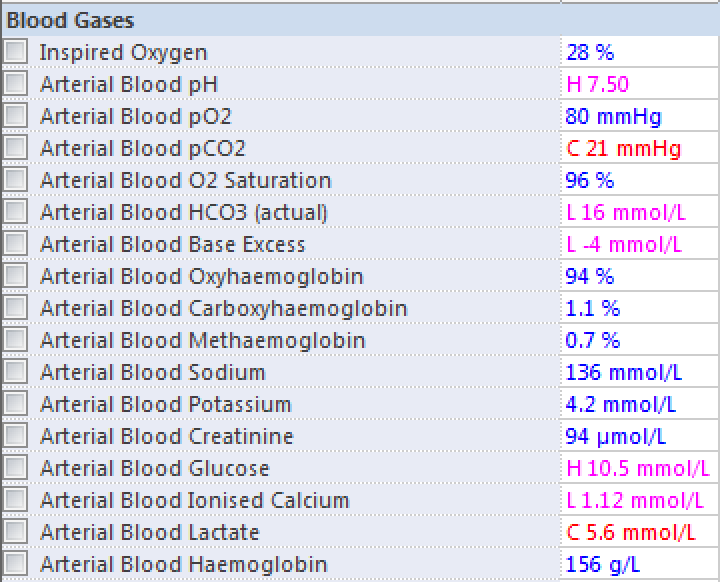 Concomitant high-anion gap (hyperlactataemic) metabolic acidosis. 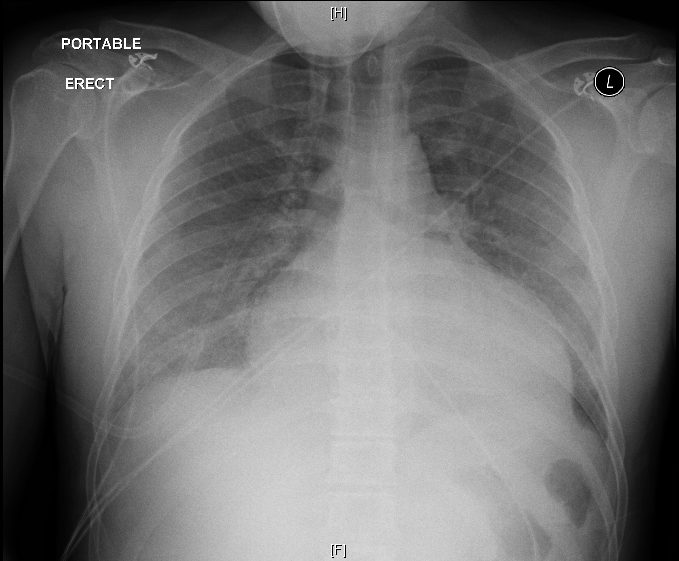 Cardiomegaly with mild pulmonary vascular congestion (correlate clinically). Globally poor LV ejection fraction consistent with a dilated cardiomyopathy. Diffuse, symmetrical B-lines on lung ultrasound confirmatory of interstitial pulmonary oedema. Left ventricular thrombus is a frequent complication in patients with acute anterior myocardial infarction and in those with dilated cardiomyopathy. The clinical importance of left ventricular thrombus lies in the potential for systemic embolisation, particularly stroke. Echocardiographic studies from the pre-thrombolytic era demonstrated that left ventricular thrombus developed in a third (& up to 56%) of patients with anterior Q wave MIs, primarily when apical akinesis or dyskinesis is present, but were infrequent in those with non-anterior and non-transmural MI (<5%). In the modern era where PCI is so readily available, these rates have fallen to approximately 5 to 15%. Left ventricular thrombus is also a common finding in patients with congestive heart failure (incidence is approximately 10-30%) as a result of severe left ventricular systolic dysfunction (especially those with dilated cardiomyopathy). The genesis of left ventricular thrombus (LVT) is dependent upon Virchow’s Triad of (1) stasis, (2) hypercoagulable state and (3) endothelial injury. The most common clinical settings complicated by left ventricular thrombus are acute myocardial infarction and dilated cardiomyopathy. Apical stasis associated with specific abnormal flow patterns is predictive of subsequent thrombus formation. Thrombus primarily develops in the first week following MI. LV Thrombus + Dilated Cardiomyopathy. Left ventricular thrombi that complicate dilated cardiomyopathy also are located more commonly at the apex, perhaps reflecting the propensity for left ventricular stasis to be located furthest from the inflow and outflow tracts. Hypercoagulability and endothelial dysfunction also are associated with dilated cardiomyopathy, fulfilling Virchow’s triad. Coexisting right ventricular thrombus (resulting in biventricular thrombus) has been recorded as high as 15.2% in subjects with dilated cardiomyopathy and left ventricular thrombus. Unlike in AMI, the formation of LV thrombus in these patients is not marked by a distinct clinical event, therefore are more likely to be ‘an occult’ clinical discovery. Embolisation of an LV thrombus post-AMI typically occurs in the second week (or beyond). Increased occurrence in patients with improved LV function (either spontaneously, or as a result of reperfusion strategies). In patients’ with dilated cardiomyopathy, the natural history is less clear. Those who do present with embolisation typically have larger ventricles and more impaired systolic function. Echo features of the thrombi such as protrusion, mobility & central echolucency appear to predict embolisation risk more accurately than serial ejection fraction assessment. 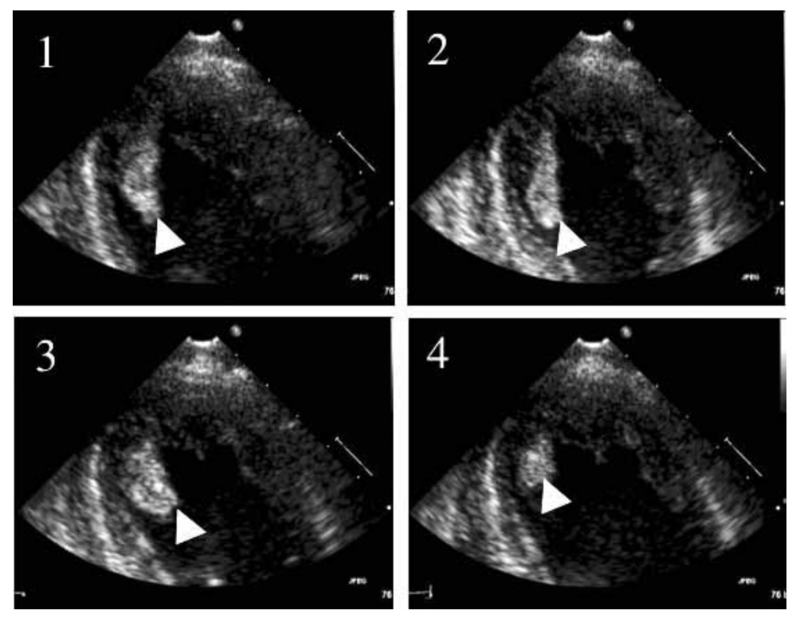 Transthoracic echocardiography (TTE) is the cornerstone imaging modality for the diagnosis of left ventricular thrombi; influenced by its availability, safety and convenience. It has been demonstrated to have sensitivity of 90–95% and specificity of 85–90% in a setting with adequate imaging. Given the propensity for thrombi to form at the apex of the LV, the best imaging planes to visualise LVT are the apical views, where the transducer is closest to the region of interest. A distinct echogenic mass within the LV cavity that is contiguous with, but acoustically distinct from the underlying endocardial surface. It is seen throughout the cardiac cycle and visualised on at least 2 orthogonal views. May be sessile/layered or protruding/mobile. An associated underlying region of severe wall motion abnormality. This is usually severe hypokinesis, akinesis, dyskinesis, or aneurysmal dilatation. Additionally; spontaneous echo contrast is commonly seen within the LV of patients with intracardiac thrombi. This is believed to be due to the interaction of red cells and plasma proteins in situations of low, stagnant flow. The presence of spontaneous echo contrast in association with marked wall motion abnormalities should warrant a high suspicion for the presence of LVT. Examples of LVT on echo. 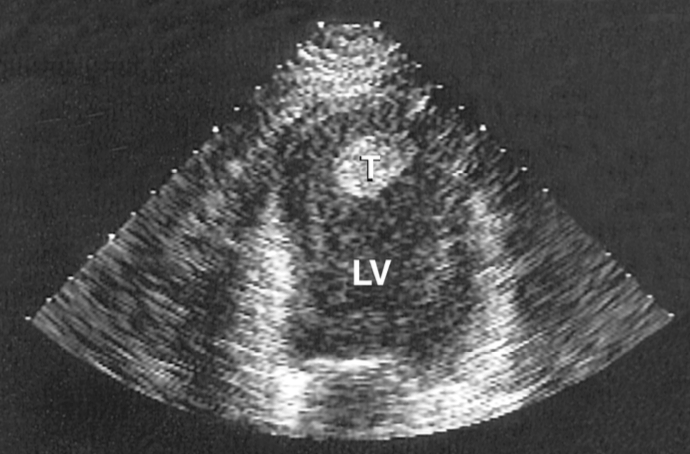 Multiple LVT with central lucency and LV spontaneous echo contrast in DCM – Image from Talle et al (2014). An apical mural thrombus (T) – Image from Stokman et al (2001). Despite the advances in ultrasound imaging technologies and higher-frequency transducers, approximately 10-30% of 2D TTE examinations remain inadequate. The use of contrast echocardiography with intravenous ultrasound contrast agents has provided incremental value in the structural assessment of the LV. 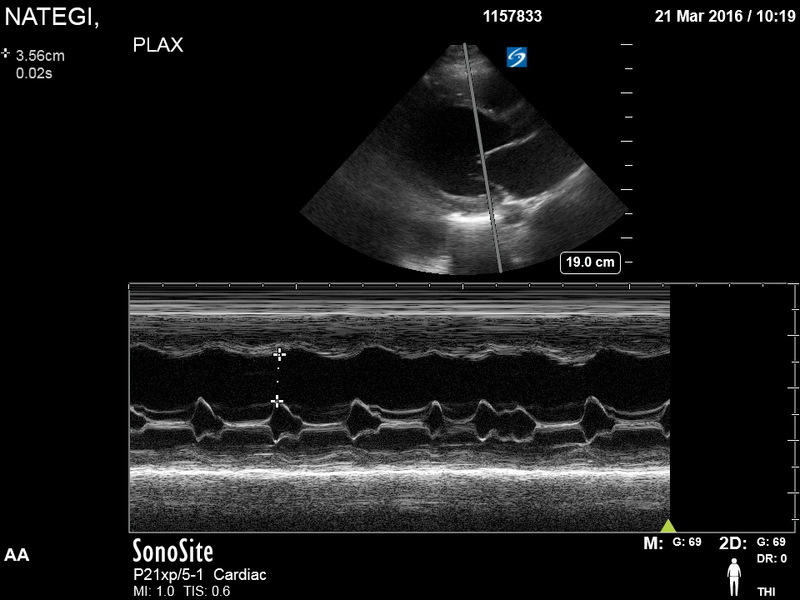 Transoesophageal echocardiography plays a less important clinical role in the diagnosis of LVT, but may be helpful for patients with very poor transthoracic acoustic windows or small thrombi. Newer imaging techniques such as cardiac CT and MRI have produced promising results for detection of LVT, especially in patients with poor acoustic windows and smaller thrombi. The goal of treatment is to prevent systemic embolus, especially stroke. In the SOLVD study prevention and treatment cohorts, the annual incidence of stroke, PE and peripheral emboli in patients with heart failure (LVEF 35%) in sinus rhythm was 2.4% and 1.8% in women and men, respectively. No data exists for the primary prevention of LVT in patients with dilated cardiomyopathy. Prevention of systemic thromboembolism, in particular stroke, has been proposed with warfarin (target INR 2-3) indefinitely, but there are no randomised trials to verified the efficacy of this strategy. There appears to be clinical equipoise with regard to the use of anticoagulation over antiplatelet therapy (WASH & WATCH trials). The treatment of LVT should be directed by the clinical risk for systemic embolism. 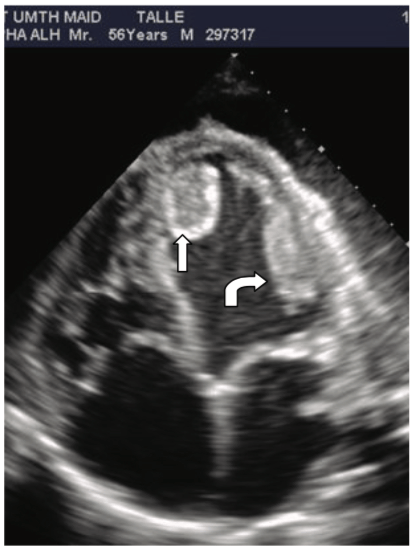 Features: recent MI, recent systemic embolus and/or thrombus protrusion or mobility on echo. Features: remote MI, absence of clinical evidence of systemic embolus and/or mural or sessile thrombus without mobility on echo. TREATMENT = Warfarin (INR 2-3) for 3 months with repeat imaging for ?resolution. Finally; intravenous thrombolytics have been used to lyse left ventricular thrombi but carry the risk of precipitating embolic events and are not routinely recommended. Your colleagues in Cardiology quickly review the patient after your initial referral & agree with the findings of your point-of-care ultrasound. 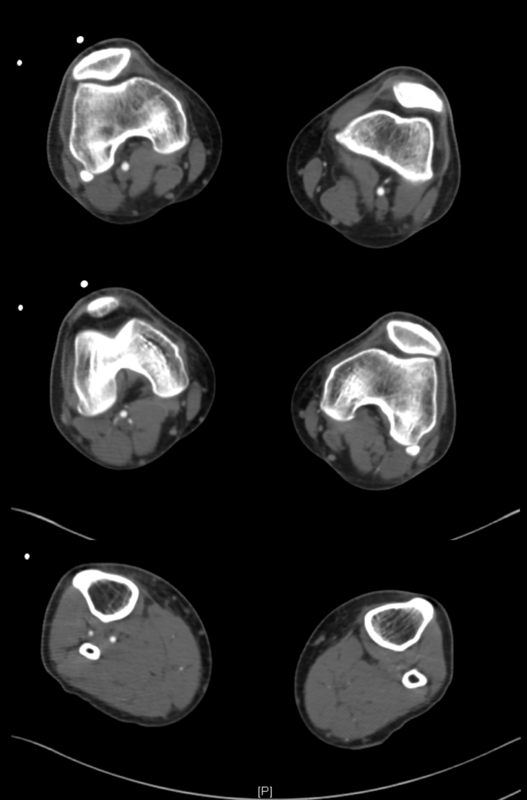 They arrange for a CT Aortogram with arterial run-off with a clinical concern of systemic embolisation from this LV thrombus with unilateral leg pain and an elevated lactate. Vascular surgery were consulted regarding his popliteal artery occlusion. They managed this conservatively. He was commenced on various medications for his cardiomyopathy including bisoprolol, perindopril and ivabradine plus frusemide for diuresis. Stokman, P. J., Nandra, C. S., & Asinger, R. W. (2001). Left Ventricular Thrombus. Current Treatment Options in Cardiovascular Medicine, 3(6), 515–521. Greaves, S. C., Zhi, G., Lee, R. T., Solomon, S. D., MacFadyen, J., Rapaport, E., et al. (1997). Incidence and natural history of left ventricular thrombus following anterior wall acute myocardial infarction. The American Journal of Cardiology, 80(4), 442–448. Stratton, J. R., & Resnick, A. D. (1987). Increased embolic risk in patients with left ventricular thrombi. Circulation, 75(5), 1004–1011. Stratton, J. R., Nemanich, J. W., Johannessen, K. A., & Resnick, A. D. (1988). Fate of left ventricular thrombi in patients with remote myocardial infarction or idiopathic cardiomyopathy. Circulation, 78(6), 1388–1393. Billingsley, I. M., & Leong-Poi, H. (2005). Left Ventricular Thrombus: Diagnosis, Prevention, and Management. Cardiology Rounds. (St Michael’s Hospital, University of Toronto). via www.cardiologyrounds.ca. Thank you so much for this amazing case and the whole site, it is great. This is one of the reasons I love Ultrasound, I’ve had several patients with a similar picture diagnosed of pneumonia (the cardiomyopathy not the thrombus). Keep up the good work, and thanks for the inspiration.